1. This is my rifle. Pfc. Forrest Anderson and Pfc. Christopher Gladstone, both with D Company, 1st Battalion, 3rd Infantry Regiment (The Old Guard), check out the R-4s at the Remington booth. Soldiers like their weapons and the Remington booth was a major draw at the convention floor. Soldiers got to handle the range of the Remington’s M-16 type rifles, the R-4s, and the Adaptive Combat Rifle which can change calibers from 5.56 mm to 6.8 mm to .300 AAC Blackout. Also on display the Modular Sniper Rifle, which provides the ability to change barrel lengths and calibers including to 5.56 mm. The Bell V-280 Valor vertical lift helicopter demonstrator. Dubbed the Bell V-280 Valor, this vertical lift helicopter demonstrator promises to be faster and fly longer than conventional helicopters. Bell Helicopter claims the Valor covers five times the area of current MEDEVAC helicopters. Could this vertical lift helicopter one day replace the Black Hawk? The helicopter is in development, and the first one should be ready to fly by 2017, according to the vendor. The GuardBot unmanned amphibious vehicle. This spiky, ball-shaped unmanned robot carries cameras and sensors inside its spherical body. The spy robot is amphibious and can trave on land, at six miles per hour, or water at four miles per hour. It can be remote controlled or programmed to navigate by GPS. Made by GuardBot, Inc. The Micro Tactical Ground Robot (MTGR). Instead of rolling around like the GuardBot this little fellow was roaming the convention floor on its tracks. It can serve as an Explosive Ordnance robot and intel collector. The 16-pound Micro Tactical Ground Robot (MTGR) can be used to disable IEDS, plant charges around an IED to blow it up and even detect Hazmat conditions, according to the vendor, Robo Team. The Special Operations Tactical Vehicle. Truck-envy is a thing. 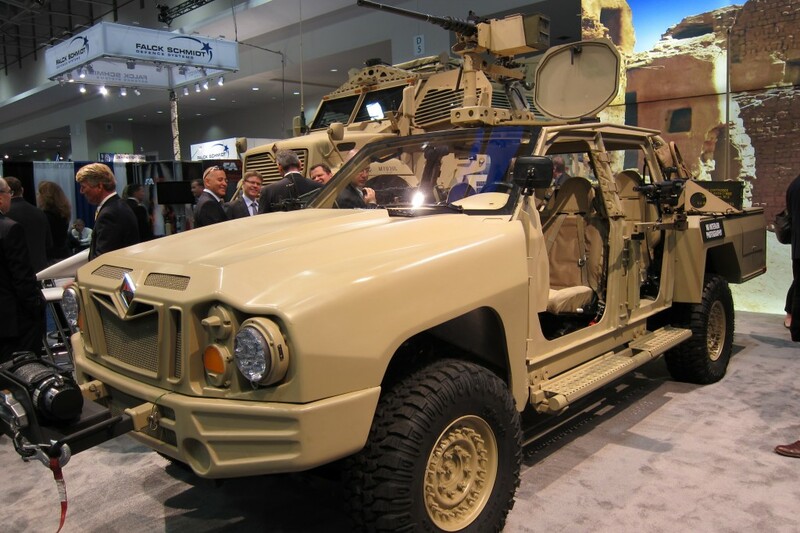 As the name implies, the Special Operations Tactical Vehicle (SOTV) was developed for special ops soldiers by Navistar Defense. It’s a 4X4 crew-cab truck with a main weapon on top of the cab. A .50 cal machine gun, or similar type weapon, can be mounted on the main weapons station, which is controlled by a Playstation-type controller from inside of the truck cab. Other weapons can be mounted out side the passenger doors. ..and the PRICE is? One would think with the military buying in VOLUME the price would go DOWN. We do NOT need a primary rifle with interchangeable calibers! We need SOLDIERS who can shoot straight and HOLD the line! As I read about Americas FINEST, my thoughts return to Col. Terry Lakin and his Remarkable Service for our Nation. Mr. Lakin had his career RUINED by the CIC, The DOJ, and The DOD. His Bravery will be a Footnote in the pages of our History Books. He had the Guts to ASK for Documentation to Prove The CIC was CONSTITUTIONALLY ELIGIBLE for the Office of President. In his Court Martial, The Judge Said “by showing Mr. Obamas Birth Certificate would be Embarassing to Him”… They did NOT allow Mr. Lakin to Present ANY EVIDENCE to Prove His Story. And The Court Did NOT PRESENT anything to Prove Obama as being Eligible!!! PLEASE, Read Mike Zullos Affidavit and START ASKING QUESTIONS!!! It is YOUR CONSTITUTION TO!!! I’m with Thomas on revering Col. Terry Lakin as a patriot. More officers should have questioned the eligibility of the CIC. The DOJ and DOD allowed an unqualified person assume the position of CIC. The military morale and status have been degraded. Christian soldiers and moral staff officers were either demoted or dismissed due to their ethical standards. Doesn’t matter the technological advanced systems we have. All will be compromised by giving our secrets to the enemy. Muslim advisors are in high positions now.